Two nights ago the Northland spent the night in the Ninilchik Harbor. 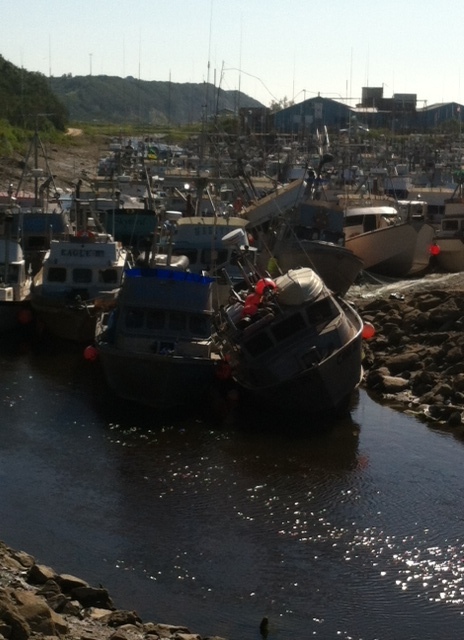 As you can see the harbor gets pretty jam packed with gillnetters and starts to look a bit precarious at low tide! Ninilchik is between the Kasilof River and Homer, near the south line of the fishing area. It is a tidally restricted harbor, meaning that the entrance and exit is only accessible at high tides. Most of the boats fishing out of Ninilchik are Russians from one of the nearby settlements. These settlements started originally as a land grant to Old Believer Russians escaping religious persecution in Russia. These days there's thriving Russian communities on both sides of Homer and they are hard working fishermen! Today was a good solid day of fishing and Kyle and the crew put up a good load of direct market, top quality, fish for our great customers. The period was extended until 11pm this evening, so the fishing continues! Tomorrow is a mandatory closure but within the next week we'll know if the run materializes to be a good return like projected, or if it is simply a little early.